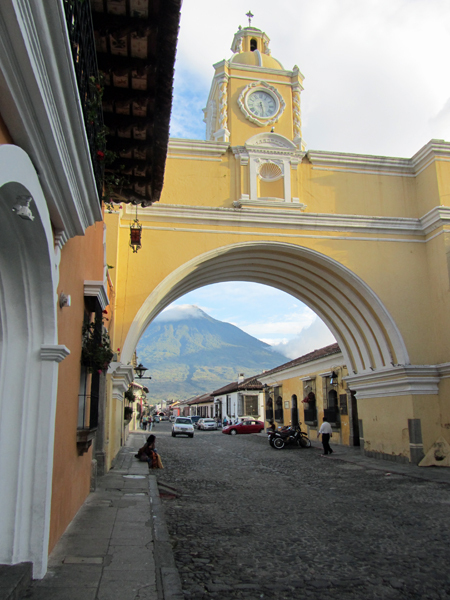 Beautiful Antigua arch with volcano in the background. You might think a town that is a designated heritage site might be old and crumbling. Yet Antigua is bright, vibrant and amazingly current while carefully retaining colonial charm. Located in the central highlands of Guatemala, this beautiful city, once the capital of Guatemala, is surrounded by live volcanoes and, over time, has been devastated by earthquakes. Throughout its history, Antigua was repeatedly damaged by earthquakes but the town was always rebuilt. A series of temblors, on July 29, 1773, created such destruction that officials petitioned the King of Spain to allow them to move the capital to safer ground, which led to the founding in 1776 of present-day Guatemala City. At one point, Antigua was left in ruins, but never completely abandoned. Today the beautiful church ruins and carefully restored homes and buildings have resulted in such beauty and charm that in 1979 UNESCO recognized Antigua Guatemala as a Cultural Heritage of Mankind site. The city is very careful to retain detailed authenticity. This is why you must visit Antigua. You’ll love the colorful walls, flower-filled courtyards and cobblestone streets. You might be surprised that there are quite a few Americans living in Antigua. And, students from around the world spend time there studying Spanish. It’s become a very upscale cosmopolitan town and Americans feel comfortable there. There are small colonial hotels such as Hotel Aurora, where we stayed. The rooms surrounded a beautiful patio. In the mornings a full breakfast was served. We always started with fresh tropical fruits and marvelous Guatemalan coffee. It’s easy to walk around in Antigua. Every street has colorful buildings, many have historic church ruins, and there are bakeries, cafes and shops dotted throughout the city. Pick up a walking map and get your bearings. Here are some sights we recommend… all within walking distance of a downtown hotel. carriage ride, or just stroll through the park. 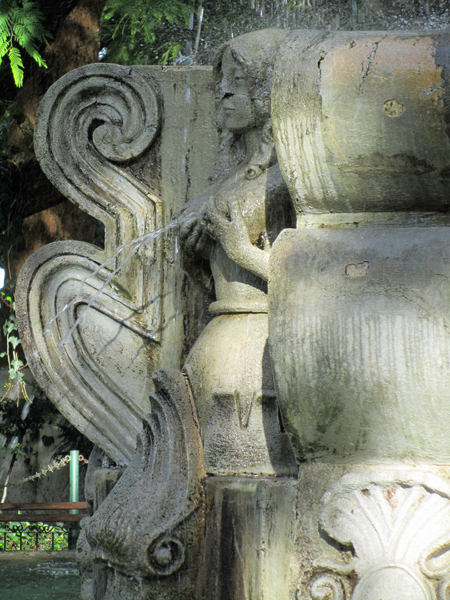 In the center is the fountain named La Fuente de las Sirenas, built in 1739 by Diego de Porres. You’ll be surprised to see water springing from the breasts of the sirens. Also in the area is La Catedral Metropolitana, El Palacio de los Capitanes Generales, El Portal del Comercio and El Palacio del Del Noble Ayuntamiento. Plaza Mayor is literally the center of the historic city. 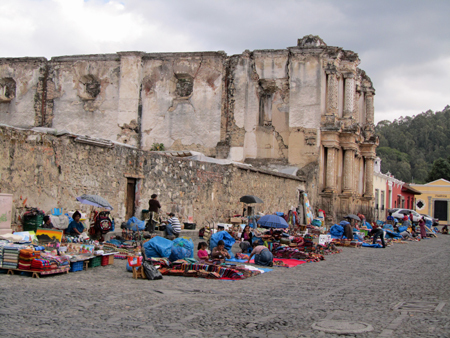 El Carmen ruins and outdoor market: The church of El Carmen, completed in 1728, is the third to occupy this site. It was partially destroyed by earthquakes. The main facade of the church is ornate Baroque. Next to the church is the Carmen market with small stalls winding through the indoor space. On weekends, the market expands to the outside of the church with traditionally dressed vendors coming in from the countryside to display their wares. City Market and Craft Market: Shop where the locals shop, or at least enjoy taking pictures. You’ll see clothing, fruit and vegetables and household goods at the city market. I enjoyed seeing women in traditional dress walking around with fruit baskets on their heads selling gum, candy and fruit. Right next to the main market, is a building with arts and crafts (read tourist) items. All things are made in Guatemala and the shopping is enjoyable and pressure to buy, minimal. They are used to foreigners here and take dollars and quetzales. You’ll find Jade jewelry, leather goods, huipils and rebozos. This is a great place to find souvenirs and, as most will need, an extra carry-bag for your treasures. Next to the markets you’ll encounter the bus depot filled with colorful “Chicken Buses” that can take you to outlying towns (if you dare!). Arch of Santa Catalina – Located on Avenida 5/ Calle del Arco, the arco was built as a passageway between the monastery and adjoining school. With the volcano in the background, this is one of the most photographed sites in Antigua. 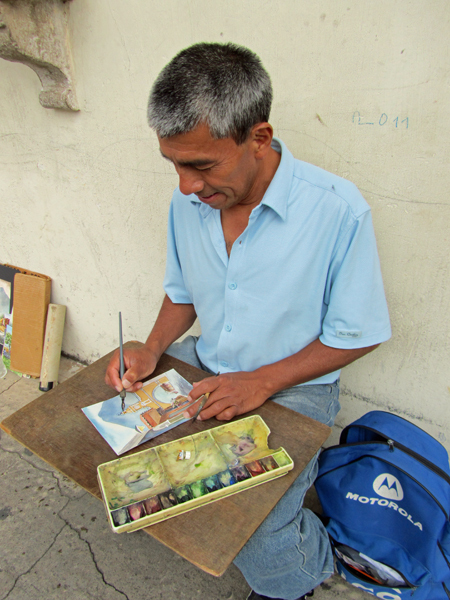 Look for watercolor artists along the street painting traditional scenes of Antigua. Buy a beautiful watercolor for as little as $10. 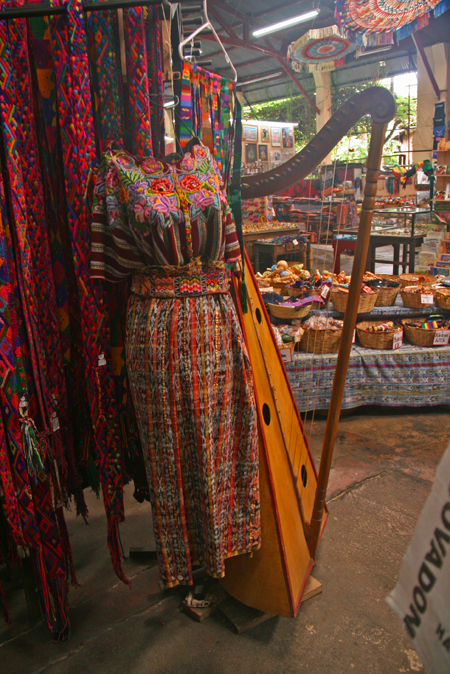 Also on Avenida 5 you’ll find Nim Po’t a fabulous folk art store. Most of the items are on consignment to the store and the prices are fair. You’ll find huipiles, weavings, pottery, masks and so much more. Marco Cobar, the manager, is very welcoming and, we found, can arrange for things to be shipped to your home (even things not purchased at his store). In the back of the store you will find a little refreshment area where you can sip on a coke or beer and, if you are lucky see a ceremony at the altar to Maximon, a very unusual Mayan god. On this street you will also find a high-end weaving boutique, Nativo’s. Nativo’s is where you will find shawls, jewelry and embroidered purses a step up from the more traditional folk-art styles you’ll encounter throughout the city. While you will pay a fair price for these boutique items, you will come away with something very special that you can wear often. All items are made in Guatemala. There are more fascinating things to see on the outskirts of Antigua which require a taxi or car. We’ll save those destinations for a follow-up article. Antigua is located only 30 miles west of Guatemala City, You can take a shuttle van. It’s an easy ride, perhaps an hour. I would recommend spending the first days of your Guatemala vacation in Antigua rather than in Guatemala City.